My introduction to music occurred around 1914, when I was 6 and living in Florida. My father played the violin in a band that performed for wealthy white people in Palm Beach. He told me later that Cootie Williams, who became a famous trumpeter with Duke Ellington, played with the group when he was 16 years old. I once asked Cootie about that and he said, "Yeah, I remember Fleming." My father once took me on a dance date, and he received permission for me to sit on the bandstand and play a kazoo with the band. From that day on, I became a devotee of popular and jazz music. I still have a strong attachment to jazz, and have followed it closely for more than 80 years, collecting jazz recordings and attending concerts, theater dates and nightclubs in Los Angeles, New York City and the San Francisco Bay Area. In Chico, California during the 1920s, we always had a piano. The fashionable homes had player pianos, which played a roll that had been recorded by some very good musician. My first year in Chico, when I was 11, I bought a saxophone with money I earned from harvesting peaches and prunes. When I got to high school, I began practicing with a group of friends several times a week, playing popular tunes that we heard on the thick, 7-inch 78 rpm phonograph records. Mom had one of the old Victrolas, which you had to hand-wind whenever you played a record. When it was finished, you turned the record over, wound the Victrola again, and played the other side. Most of the dance bands played the same style of music as Paul Whiteman, a white musician and bandleader who was very famous at the time. The white world called him the king of jazz. At first I thought he was the greatest thing in the world. 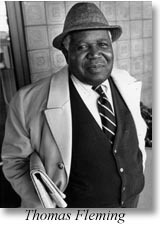 Then I heard Fletcher Henderson, a black bandleader and pianist who was more spirited than Whiteman, and I liked him much better. The music stores had postings of new records every month. You told the clerk your choice to hear; he would conduct you to one of several enclosed booths, each with a phonograph. You played the records, picked out the ones you liked, then made your purchase. The stores also sold sheet music. 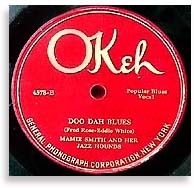 The Okeh label made a lot of what was called race records, by such people as Fletcher Henderson and his big band, Ethel Waters, Mamie Smith and her Jazz Hounds, Bessie Smith, and the comedy team of Miller and Lyles, who presented hilarious dialogues. The record shops everywhere sold them -- not just in black neighborhoods. Chico had two outdoor dance arenas, one on the north end of town and the other about 12 miles south. Sometimes a big-name band would come through there, and now and then they would bring in a black group. The town also had one theater for stage acts, the Majestic. In 1924, a musical revue that starred Mamie Smith, the great blues singer, had a long run in San Francisco. After closing, it toured some cities in the Sacramento Valley, including Chico, where it appeared at the Majestic for two nights. I attended both nights, fascinated with a show of that size playing in the hick towns. Chico had a tiny black population, so most of the audience was white. The cast, which was all black, included Smith, an orchestra of about eight pieces -- saxophone, clarinet, piano, drums, trumpet, trombone, banjo -- a chorus line of maybe six girls, all good-looking, and a number of comedians. One I recall with pleasure was Frisco Nick, who staged a hilarious dance while he sang "Three O'clock in the Morning," a great waltz hit, with a broom as his partner. Except for Smith, the entire cast was from the San Francisco Bay Area. Mamie Smith was about on a level with Bessie Smith. She played the black circuit theaters in the Middle West and the East Coast. The black circuit didn't exist on the West Coast, because they didn't have separate theaters for blacks and whites, although in some places, such as Portland, Oregon, blacks could sit only in the balcony. There was practically no radio then -- at least, we couldn't get it in Chico. Crystal sets came in around 1922 or '23, but I didn't know any blacks in Chico who had a radio. Around 1925, I would visit a black friend in Oroville who had a console model, and we'd listen to the bands playing from the big hotels. All over the nation, they booked dance bands in rooms called supper clubs, where bootleg booze was sold discreetly. When radio became popular, it provided another medium for jazz devotees to hear bands playing from many cities -- sometimes from the big hotels, other times from nightclubs. Earl Hines played from the Grand Terrace in Chicago for a long time. Count Basie first played piano with the Bennie Moten band in Kansas City, which was one of the hot spots where jazz was heard nightly over the radio. Chicago had the Grand Terrace, a big nightclub with lavish floor shows, located on the South Side, a black section of the city. The Grand Terrace had a largely white clientele who liked good jazz and filled up the place up nightly. Nightclubs throughout the United States had varying policies on black entertainers, depending on what part of the country you were in. A lot of them had black bands, but they rarely hired black dancers or singers.